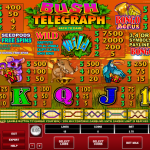 Bush Telegraph is an older Microgaming slot which takes you deep into the Australian bush. Here you will have a chance to see the wildlife as well as enjoy some native music on the Bongo Drums. The slot has low level animations and visual effects, but all of the symbols are well designed with a vibrant choice of colors. If the visual effects are not appealing enough for you then the bonus features are sure to catch your attention. The Wild Bush is the wild symbol in the game and it will substitute for all other symbols except the scatter and bonus symbols. The scatter symbol in Bush Telegraph is the Seapod and it will award a great payout of 400 x stake if 5 of them land on the reels. If you land 3 or more of them on the reels you will trigger the free spins bonus which will award you with 10 free spins. All payouts during the free spins are tripled in size and the bonus can be re-triggered. The slot also has another bonus game triggered by landing 3, 4 or 5 Bongo Bonus symbols on an active pay line. Here you will need to make picks among 12 Bongo Drums depending on the number of triggering symbols. Each drum will award a coin prize and players can win up to 2.500 coins in this bonus. 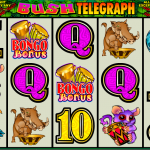 Bush Telegraph is a simple Microgaming slot which is very fun to play. The slot doesn’t have modern visual effects but does offer an attractive set of bonus features. 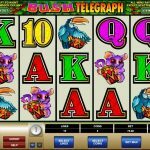 With a classic free spins and a cash bonus round Bush Telegraph offers enough to catch the attention of every online player. All you need to do is try the slot for real play and win big. If you want to play one of the all time classics then you should consider playing Break Da Bank Again a 5 reel slot by MicroGaming.